I had to laugh the other day because I saw an ad for a local fundraiser titled, "Low Carb BBQ". Um yeah, I thought to myself, "I'll bring the buns and the potato salad! ", which brought me to this special blog. 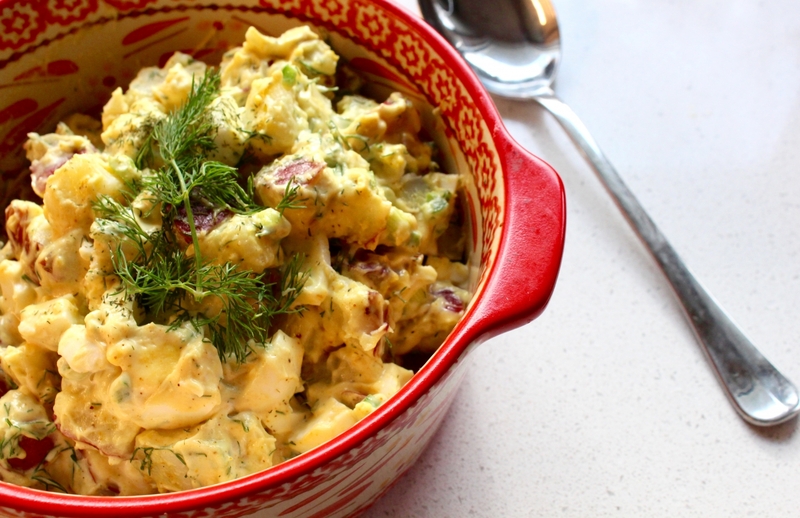 Barbeque season or not, potato salad is a favourite in my household. My husband LOVES potato salad, but not just any potato salad, he is super particular and makes an amazing potato salad. This week I had him write down the recipe as he put it together because the foodie in me wanted to share it with all of you! But of course, the dietitian in me also wants to share another great reason to love potato salad - RESISTANT STARCH. Resistant starch is a type of prebiotic - a starch found in certain foods that are resistant to digestive enzymes in the small intestine, thus, pass through to the large intestine where they're fermented by the microbiotia (AKA healthy gut bacteria) and produce beneficial short chain fatty acids (SCFA) - butyrate, proprionate, and acetate. Research is showing that resistant starch has many health properties, including an important role in gut health. "The estimated daily intake of resistant starch by Americans is ∼5 g per day, much less than the minimum of 6 g of resistant starch per meal recommended for health benefits" (1). SCFA have been shown to reduce intestinal pH which helps to prevent overgrowth of pathogenic bacteria. Particularly, butyrate seems to "promote large bowel blood flow through relaxing resistance vessels, improving tissue perfusion and oxygenation". Also, "a wealth of experimental data shows that butyrate inhibits the growth of cancer cells" (2). What does this have to do with potato salad? Cooked and cooled starches, such as potatoes, are considered a type 3 resistant starch. Potatoes are a highly affordable, energy dense, nutrient dense (hellooo potassium and fibre) root vegetable. They grow locally, they're a versatile ingredient, and despite popular belief, no, potatoes are not "fattening" nor the cause of a person's weight issues. 1. Boil potatoes in lightly salted water until tender and you can pierce with a fork (but don't overcook or your salad will be too soft). Drain and let cool. 2. Combine all ingredients, mix well, and refrigerate until ready to serve.